13 years of misery. 13 years of happiness. 13 years of celebration, joy, excitement. 13 years of anger, frustration, and disappointment. 2006 was my freshman year at the University of Cincinnati. It was also Mick Cronin’s first year as head coach of the Bearcats. Fresh off a successful three year stint at Murray State (69-24 overall), Cronin returned to his alma mater, where he served as an assistant to Bob Huggins, to undertake a massive rebuilding job. “Massive rebuilding job” is probably still an understatement. I won’t get into the details the plagued Cincinnati following the firing of Bob Huggins, mostly because everything I have to say is second hand. I wasn’t in Cincinnati at the time. I know that it was controversial and I know that when I arrived on campus, there was a large faction of fans and alumni that were still Bob Huggins supporters. Now, about that rebuild…. for me, at 18 years old, I was naive. I had no idea. I had no clue what Cronin was in for. I didn’t fully comprehend the scope of the situation of the college basketball landscape to the extent that I should have. Basically, I attended Cincinnati as a student thinking I was going to a powerhouse basketball school. I was wrong. Just a little wrong. 2006 through 2010 represented the worst four year stretch in school history. 2006-07 – Cincinnati went 11-19. This included a loss in the fourth game of the season to Wofford. WOFFORD! This wasn’t your 2019 Fletcher McGee Wofford. This was a Wofford team that finished that season 10-20. Yikes. In 16 Big East games, Cincinnati won twice (shame on West Virginia and Seton Hall). The roster was a joke, but that was no fault of Cronin, who did what he had to do to simply field a team. There was a football player (I love Connor Barwin! ), 6 Junior College transfers, and only one true four-year freshman (Deonta Vaughn). Winning 11 games was actually impressive, especially considering the beat Xavier (a tournament team), NC State, and a 27-win West Virginia team. 2008-09 – In year 3 of a total rebuild, Cronin led Cincinnati to his first winning season, going 18-14, and once again 8-10 in Big East play. Like the previous season though, the Bearcats ended the regular season horribly, losing 5 of their last 6 games. Playing in the Big East Tournament, they lost to previously 0-18 Depaul in round one. I remember being the first time I was legitimately upset. The first time I really went on a “#FireMick rampage”. To this point, I understood the consequences, I understood what happened that forced a massive rebuild from the ground up, but losing to an 0-18 Depaul team just seemed inexcusable and set me off. I know many others too. You could see that they were making progress. You could see the signs, but you could also see the major flaws. Ending 2008 with 7 straight losses and losing 6 of 7 to end 2009 just left such a sour taste. Sent a message that Mick Cronin’s teams couldn’t close. Couldn’t get the job done. Maybe the writing was on the wall at that point – that Mick would never end a season strongly. 2009-10 – This was a weird season. There was plenty of success and plenty of failure. It was Lance Stephenson’s one and only year at UC, Mick’s only one-and-done guy in 13 years. Lance never seemed to fit into Mick’s style of play, though he did lead the team in scoring at 12.9 ppg and 5.4 rpg. The season started off promising for Cincy, who made the Maui Classic Championship game, losing to Gonzaga. They managed to win 19 games, a new high in the Mick Cronin era, but the Big East record dropped to 7-11. Cincinnati was 15-9 overall and 6-6 in Big East play and looked like they could compete for a bubble spot in the Tournament. But for the third straight regular season, they collapsed, losing 5 of the last 6 games, including a 74-47 loss in the finale to Georgetown. At 16-14, Tournament hopes were completely gone. For the first time in 2010, there was postseason success – Cincinnati won a Big East Tournament game for the first time, 2 to be exact before losing to West Virginia in the quarterfinals. They made the NIT, losing to Dayton in the second round. Four years, two winning seasons, nothing to show for it. FINALLY – in 2010-11, the Bearcats broke through. Bearcats opened the season with 15 straight wins, including an undefeated OOC slate, and would go on to finish 26-9 overall and 11-7 in the Big East, good enough to clinch an at-large spot in the NCAA Tournament as a 6 seed, their first under Mick Cronin. The previous season ended with a pathetic 27-point road loss to Georgetown. This one ended with an emphatic 22 point home win over 17th ranked Georgetown, in a game that essentially sealed the Bearcats dancing bid. This team included Yancy Gates, Dion Dixon, Sean Kilpatrick, Cashmere Wright, and Rashad Bishop. Mick’s strongest roster at the time. More on the tournament run below, but the season ultimately ended in the second round, losing to Big East rival UConn, who would go on to win the National Championship. 2012 started out miserably – Bearcats lost the third game of the season to a school called Presbyterian. On December 10, Cincinnati got blown out by Xavier in the famous brawl game. Suspensions and punishments followed. It seemed like Cincinnati was about to trend downward and that the previous year may have been a fluke. But not only did they show resilience, they went 12-6 in Big East play and even made the Big East Tournament Championship, losing to Louisville 50-44 at MSG. To get to the Championship game, they beat Syracuse, ranked #2 at the time in the biggest Cronin-era win. They would win two NCAA Tournament games, losing to Ohio State in the Sweet 16. 2013 was the beginning of the AAC and the Bearcats have been the most successful regular season team over that time (Louisville and UConn have both won National Championships, so hard to call Cincinnati the best overall AAC program). 2013-14 – Finished 22-7 and 15-3 in conference play as AAC proved to be a little less stressful than the Big East was. 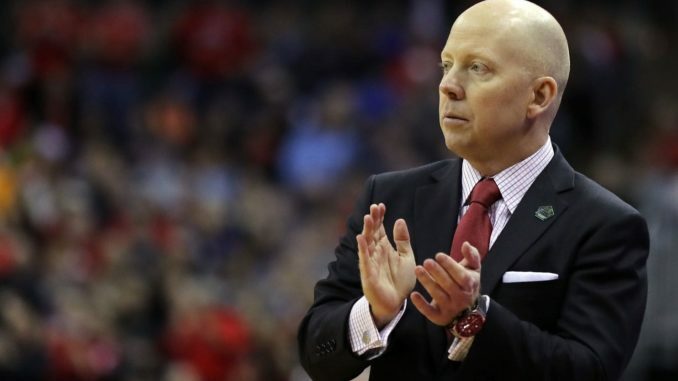 To say Mick Cronin was unsuccessful in the NCAA Tournament would be true. But to say so without the full context, would be wrong. Yes, in his career, Cronin is 6-11 in NCAA Tournament games. But when you dissect it fully, it’s not really as bad as it looks. 2 of those losses came at Murray State. In 2004, Racers lost as a 12 seed to Illinois and in 2016, lost as a 14 seed to North Carolina, by only 4 points. No shame in either of those losses, especially at a mid major school. 2014 – Terrible, terrible loss. Lost as a 5 seed to Harvard. No excuse, this was bad. I see two horrible losses. The rest is about context of expectations. Are fans really going to blame Cronin for losing to three teams that made Final Fours (2011 UConn, 2012 Ohio State, 2015 Kentucky)? What about that excellent UCLA team. Iowa and Creighton first round losses are bad, but they would have likely lost in round two, so at the end of the day, how significant are those losses? 6-11 looks bad on paper, but context absolutely matters. And Mick’s March’s weren’t that bad. When you look at the overall situation, Mick Cronin did an excellent job getting Cincinnati back on track, navigating a very rough stretch and elevating the program back to national prominence. Mick dealt with constant instability around him – there were several school Presidents, three different Athletic Directors. Two conferences. While the world kept changing around him, he kept pushing forward with building the program. There are things most fans don’t care about but I do, such as a clean program. There are no pending allegations or NCAA investigations. No off-the-court drama from coaching staff or players. For the most part, Mick’s players all graduated. Sure, his offensive style was boring and watching this team was a struggle at times. But they won. And winning is awesome, no matter how ugly or how painful it is. I don’t think he has very ever fully appreciated because of his lack of a big run in March but compare Cincinnati to recent seasons from blue-bloods like Indiana and UCLA and it’s not even comparable how good we were. I’m proud of Cronin. I am very happy he led Cincinnati for 13 years and I am proud of the program he helped build. We obviously never got over the hump in March, but I wish he would have stayed and finished the job here. I’m glad he got to achieve his goal of coaching his alma mater and proudly represented the C-Paw for as long as he did. I will miss Mick Cronin, I will forever appreciate the tremendous job he did and hope he finally has tournament success at UCLA. We’ll see what happens next. The program is in good shape, with national relevancy, new arena, and a strong roster for 2019-20 (pending potential transfers). The new coach comes into a situation where the AAC is trending upwards. Houston kept Kelvin Sampson and should stay near the top of the conference. UCF finally broke through in 2019. UConn with Danny Hurley and Memphis with Penny Hardaway will be back soon. So will Wichita State, following a down year. It’s not a bad conference by any means. The new coach won’t just be able to coast into the Tournament. I will fully support whoever Cincinnati hires – whether its an older P5 coach, a young mid-major guy, a former alum, whoever. I have strong opinions about certain candidates but with no clear cut home run hire, I trust AD Mike Bohn to hire the best guy to continue to maintain consistent success and elevate Cincinnati in March. I hope the whole fan base gets 100% on board with the hire, whomever it may be.